The Annual Catbacker Tour (formerly known as the Powercat Summerfest) is the marquee Wichita Catbacker event of the year, drawing hundreds of K-State Catbackers, alumni, and friends in attendance each summer. Live and silent auctions create friendly, but competitive, bidding wars on a multitude of unique items from local and regional merchants, personal donors, and the K-State Athletic Department. Attendees enjoy dining on a well-catered meal that has consisted of culinary themes such as homestyle, barbeque, and Italian foods. On top of enjoying the company of fellow K-Staters, Catbacker Tour goers also get the honor of listening to many guest speakers from K-State, including coaches, athletic department and university staff, and student athletes. These valued guest speakers provide insight on last sports season’s highlights and how student athletes have progressed since then, always looking forward to the next season. Additional past events, such as photo booths, book signings, raffle drawings, and even putting games, make the Catbacker Tour an action-packed evening that cannot be missed by area K-State fans! Grab your clubs and three more golfing buddies as you compete in a 4 person scramble against fellow K-State friends on one of the many great golf courses in the Wichita area. While you’re trying to conquer the fairway, keep an eye open for the beverage cart, as well as K-State student athletes who just might be ready to help your team sink the next putt! After the golfing is over, retreat to the clubhouse to enjoy a catered meal, listen to guest speakers, try to win raffle items, and learn how your team ranked in its flight. Staying true to our mission statement, the Wichita Catbackers host live and replay watch parties of select K-State football and basketball events in order to encourage K-State fans in, or visiting, Wichita to come together and cheer on the Cats. Attendees never pay a cover charge to enjoy the fun-filled and K-State-friendly atmosphere that our watch party locations provide, but they can buy a raffle ticket or two to try to win great K-State items, like autographed footballs and basketballs, usually given out during halftime of the event. These watch parties not only give K-Staters the opportunity to join in on the victory cheers and chants, but also to enjoy exclusive food and drink specials that our host establishments give us during the game. Keep an eye out for the next watch party event and join us there! The Wichita Catbackers keep busy throughout the year by providing or supporting even more opportunities for K-Staters to enjoy Wildcat activities by hosting other events like exclusive shopping nights at various Wichita merchants, setting up tailgating tents in Cat Town, and coordinating travel accommodations for home and regional away games. 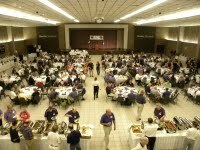 As always, Catbackers have strong showings at local K-State Alumni Association and Alumni Club events, such as wine and beer tastings, social happy hours, barn parties, ice cream socials, and tailgating events before KSU vs Wichita State games when K-State travels down to play here in Wichita. Become a Wichita Catbacker today and join in on the many fun K-State events held in Wichita each year!